An African-American military officer tells his story—or, rather, his two stories. 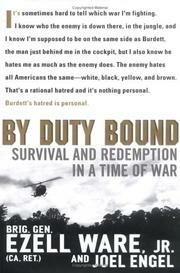 Ware’s first is about how, in 1971, he survived for three weeks in the Vietnam jungle with a very wounded, very racist captain after their chopper was downed; the other is about how he rose from Mississippi poverty and discrimination to become a brigadier general in the California National Guard. Unfortunately, though, Ware and journalist Engel (who ghosted By George: The Autobiography of George Foreman, 1996) employ a most clichéd narrative device to do the telling: the intercutting of Ware’s two tales, chapter by chapter. In the Vietnam War one, we follow the two principals—the black man and the wounded former KKK member—as they struggle to survive. They battle starvation (insects soon compose the menu), sleep-deprivation, a tiger, two of the enemy who find them (Ware kills them both), leeches, depression, a worsening wound, incipient madness, racial strife. By the time they’re rescued, Ware and the Klansman are buddies. And in the story-of-my-life segments, we follow Ware’s escape from a broken home (his father is gone much of the time) and from Jim Crow at its most vicious. Ware does well in school and in athletics, and he eventually joins the Marines, where he excels at Parris Island. But he wants to fly, and the Marines seem disinclined to train black pilots, so after leaving the Marines, he enlists in the Army and qualifies for flight school. We learn about Ware’s love life (he marries and divorces an unfaithful woman—and enjoys some sexual encounters in Vietnam), his ambitions (he wants to be a general), and his political positions. He argues that the US did the right thing by waging war in Vietnam (the Tet Offensive, he says, was actually an American victory—the press got it wrong), and he comes across as just a red cape shy of Superman. Manufactured suspense, along with pages of invented and hackneyed dialogue, vitiates this account of the varieties of heroism.